When I posted about my recent experience in Frankfurt, I got a response from an online friend of mine who is an American Jew living in Germany. She was sorry to hear about my impressions of Europe, because they didn’t reflect her own experiences. I was delighted when she offered to write a guest letter about it, because I have been focusing a lot on antisemitism in Europe and I’d like to provide a different, more optimistic perspective. I met Naomi on an interfaith group on Facebook. As you will see in her letter, she and I share many interests! The rest, I will let her tell you. This letter, like the last few, is in the form of an interview. Enjoy! I’m Naomi, born and raised in the San Francisco Bay Area and currently living in Munich, Germany (with some time spent in between in New York, Prague, and Jerusalem). Over the years I studied creative writing, history, dance, and social work–I currently have a master’s degree in social work–and my passions and interests largely lie in the arts, working with people, culinary adventures, and being outdoors. My cultural and religious background is somewhat multifaceted, as I was initially raised as a Reform/liberal Ashkenazi Jew, then my parents became more Jewishly observant and joined a Modern Orthodox synagogue. From preschool through high school, I attended Jewish day schools (and was in the first graduating class of two brand new ones) where I learned Hebrew, some Aramaic and a ton about Judaism. Though I’d consider myself “just Jewish” these days, I feel quite well-versed in my religion. And growing up in the Bay Area I’d probably describe my cultural leanings as “liberal, curious and open.” I ended up in Germany as my husband was getting his PhD here. I initially worked as an au pair for a year prior to grad school, then returned after I finished my degree right before our weddings. (Yes, we had two weddings!1) I spent a lot of time here in between as well. I [Daniella] posted recently about a negative experience I had in Germany and the discomfort I feel as a Jew in Europe. (Josep also shared, in the comments, about a negative experience he had in Berlin.) We also had a guest letter from a French Jew who loves France dearly, but feels very uncomfortable there as a Jew. Your experience, in contrast, has been largely positive. Can you tell us about that? My experience as a Jew in Europe has been somewhat unique, particularly in the context of most German Jewry; I have some knowledge and experience of Jewish life in the Czech Republic as well. So I have to preface this by saying that I can’t really speak for all of Europe as a continent, as it’s very heterogenous and Jewish communities vary wildly throughout the region. By “unique” I mean the fact that I am neither German nor from a former Soviet Republic, the two communities that make up the majority of Germany’s Jewry, so I’m a bit of an outsider in that regard being an American. My husband, son, and I belong to the liberal Jewish synagogue in Munich, which in and of itself has been a positive experience. It’s a very warm and welcoming community with a diverse membership; we have Brazilian, Israeli, and Australian members, to name a few countries. I started becoming involved in an organization called Rent a Jew2, where Jewish community members go to schools and workplaces to put a human face on the Jewish community and share personal anecdotes and experiences about Judaism. As one might imagine, Jews are rather a minority in Germany (there are quite a few in urban areas such as Munich, but don’t make up a significant part of the country’s population), so being Jewish is a different experience than in a place like New York City or London, where one can often assume that people have heard of holidays like Hanukkah or know that there is such a thing as kosher food. You really can’t assume any kind of basic knowledge, so people often have questions for me if they find out about my background–or, very interestingly, people will often mention that they themselves have some Jewish heritage–particularly in Prague, where the vast majority of our friends have at least one direct Jewish ancestor. I also find, on a personal level, something emotionally significant about pursuing Jewish life in Europe after World War Two. I feel strongly that it’s important for Judaism to continue to thrive here. It’s almost like a full circle, as my ancestors had to flee from persecution and now I can come back and, in a way, help “rebuild” within the community. Also, unlike back in the US, there are hundreds of years of Jewish history here4, and as someone passionate about history, that’s been a fascinating exploration since I’ve been living in Munich. You are married to a non-Jewish Czech. How have you acculturated to each other’s different backgrounds? I would say pretty well. My husband probably knows more about Judaism than many Jews! He has learned quite a bit of Torah, is currently studying biblical Hebrew and Yiddish. One of our weddings was also Jewish. So in terms of acclimating to my family’s Jewish background, I’d say he’s very well integrated and very involved. Culturally speaking, Americans and Czechs have a few differences (from my perspective)–Americans are often perceived as overly effusive and sometimes insincerely friendly, and Czechs are often perceived as being withdrawn and sarcastic. However, these are stereotypes that one side often has of the other, an issue with every country’s culture. My husband has spent quite a lot of time in the US, including two stays as a student, so I think we are each in the position that we have had a lot of time and opportunity to integrate into one another’s communities. Sometimes there are funny differences, like my American family’s bewilderment that most Czechs–and Germans as well–don’t have a dryer. Apparently living without a dryer is very un-American! When your son was born it was important to you to have him circumcised according to Jewish tradition. Can you tell us about that experience? How did your husband feel about it? Both my husband and I did feel it was important to have a Brit Milah for our son, to have him connected to the Jewish community through a very tangible and powerful experience. It really is very powerful, as it’s obviously not easy to have such a tiny baby go through that, and as a mom you are just recovering yourself from childbirth and are totally out of it–so it’s an intense day for everyone involved. It felt especially significant to have him have his Brit Milah in a country where the ritual is extremely rare and occasionally under threat (one of the few things that unites Jews and Muslims on a regular basis in Europe). To be completely honest, if it wasn’t such an important facet of Judaism, I’m not sure I would do it of my own volition. But in the end, I am happy he is part of such a lineage, and I’m proud every day of my Jewish-American-Czech-Bavarian little guy (or however else he may choose to describe himself in the future). He is a part of so many cultures, naturally from birth, that I’m almost a bit jealous. Are you a Jew living in an unusual place? Or any other person with something interesting to share? Please consider sending us a guest letter! To view previous guest letters, click here. So, speaking of antisemitic a-holes…..
As you know, I’m in Denver visiting family now. We flew Lufthansa this time, with a connection through Frankfurt. I hate going through customs in NY and was glad to be able to skip that part of the procedure this time, and, well, I thought it would be nice to fly through Europe. I got to show my kids the Alps through the window of the plane. The last–and only–time I’d seen them myself was from the window of a plane from Barcelona to Zurich. We also happened to find ourselves on a plane with activist-turned-MK Yehuda Glick, an absolutely fascinating character and fellow stereotype-smasher who I greatly admire. He was on his way to Washington D.C. for the inauguration. We exchanged a few pleasant words with him. Our few hours in Germany, though, proved a little more harrowing than I had anticipated. Listen… I’m not hysterical about antisemitism and Holocaust associations. I know, intellectually, that the Holocaust was a long time ago, and that most Germans are perfectly decent people, and that Germany actually has one of the lowest rates of antisemitism in the world right now. But… memory of the Holocaust is so deeply ingrained in my national and religious identity, it’s a trauma the reverberates through my subconscious. I’ve been to Poland, as you know, but I was going there for the express purpose of learning about the Holocaust, and I was surrounded by a warm, supportive cocoon of educators and friends. Here, we were just passing through, a very “visibly Jewish” family. And there was no way around it. I couldn’t shake the associations. I imagine you’ve been in the airport in Frankfurt and know what I mean when I say that the decor didn’t help. The place has a gray, industrial, austere air to it that was less than comforting. Let’s just say I was a little on edge. It was with this unease that I approached the security checkpoint. The man behind the X-ray conveyor belt rattled off instructions in an eerie robot-like, monotonous voice. He wasn’t talking to us like we were humans. “Everything in a box,” he repeated over and over before we understood that he meant our bags needed to go into boxes too. Flustered with his strangely hostile manner (and its uncanny historical overtones), I remembered to remove my laptop from my carry-on, but forgot about the kids’ tablets in their bags. We went through the full-body scanner–an apparatus that makes me profoundly uncomfortable–and both Eitan and R1 got a pat-down. When we went to collect our bags and coats, we found that some of them had been set aside, and the robot-voices man asked Eitan to open them. At this point H was getting pretty upset. We’d been through a similar (less rigid) security procedure at Ben-Gurion, and no matter how I tried to explain to him that they were just being extra careful to keep everyone safe, he just got more and more upset. I took him aside and tried to calm him. Then the robot guy called a couple of police officers over to look at one of the bags with Eitan, apparently concerned about the fact that we’d left a tablet in there. I can’t help it, Josep. Watching a pair of German policeman approach my husband when I knew we’d done nothing wrong… I have nothing else to call it but “triggering.” I was starting to freak out a little myself. I breathed and tried to focus on calming H down. The policeman were much nicer than the robot guy and seemed pretty bewildered as to why he’d called them over. Eitan and I were both harboring a niggling suspicion at this point. Let me stop here and explain the context of that comment for the sake of any blog readers who need it. It was not an antisemitic comment. It was a stupid anti-Israel comment. But as Eitan pointed out to me later, only Israelis get those kinds of remarks. If we’d been from Iran, would he have said, “Hey, nice centrifuges you’ve got there”? If we’d been from Russia, would he have said something about the Crimea, or the slaughter in Aleppo? If we’d have been from China, or Turkey, or any number of other countries committing severe human rights abuses on a regular basis, would be have made a snide political remark? Of course not. Residents of those countries are seen as victims. Only Israelis are held in contempt for the actions of our government. Holding Jews collectively responsible for the actions of other Jews is a classic manifestation of antisemitism. The content of the remark wasn’t antisemitic, but there’s a good argument that its context was. Eitan was livid. He told the man to keep his political opinions to himself. “I didn’t state a political opinion,” was the breezy response. All I wanted to do right then was get the hell out of there. Out of the room, out of the airport, and out of the country. Every other German employee we encountered was somewhere along the spectrum from “pleasant” to “wonderfully helpful and sweet.” The Lufthansa stewardesses especially were really lovely to our kids. 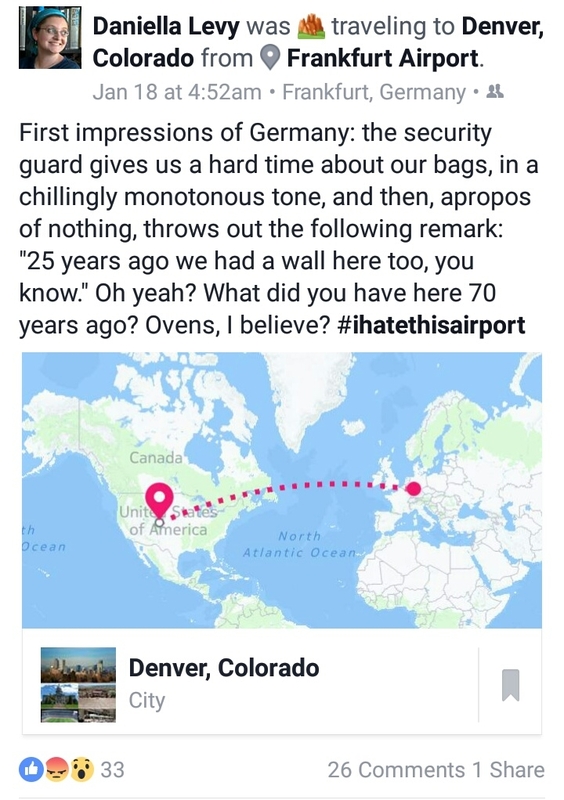 But sadly, it’s the little incident at the security checkpoint that will remain burned into our memories from our few hours in Germany. When I visited Paris as a teenager, I wandered along the Champs-Élysées with a group of friends, one of whom was a French speaker (having lived in France until she was eight years old). She got into conversation with a friendly vendor, and when he asked us where we were from, there was this long, tense pause. We had been specifically warned not to tell anyone where we’re from. So I stepped forward and took advantage of my American accent to say we were from America. The rest of the group stayed very silent as my friend made up an elaborate story about why she spoke French and lived in the US while looking Moroccan. Every time I’ve been abroad, I’ve had a moment like that where one of the locals asks me where I’m from, and I pause, wondering what kind of a turn the conversation is going to take when I tell them the truth. I actually had that moment with you, in the first conversation we ever had. It’s scarier when I’m in Europe. If you’ve ever wondered why I sound less than enthusiastic about traveling to Europe with my family… this is a major factor. It’s not much of a vacation when you feel on guard all the time, worried that someone might be cruel or unfriendly to you just because of where you’re from. It always feels like Passover sets off this domino rally of significant days on the Jewish calendar. This coming Thursday is Holocaust Remembrance Day. But before we get into the tough stuff, I wanted to start us off with some general discussion of contemporary European Jewry by posting this fascinating guest letter. France is home to the third-largest Jewish population in the world (after the USA and Israel)–some 475,000 people, with more than half of them living in Paris. Unfortunately, there has been a sharp rise in antisemitic incidents in Europe in recent years, and France has suffered some of the biggest and highest-profile of these incidents. Largely as a result of this, as I’ve written before, Jews have been leaving France in droves. In 2014, for the first time in history, there were more olim (new immigrants to Israel) from France than from any other country in the world. The trend continued in 2015, with a further 10% increase. Jews are feeling less and less safe in Europe. And then I thought, hey, why not interview him properly for a blog post? So this guest letter is a response to my questions (which I will include in their appropriate places). I hope you enjoy! My name is Aviv and I am doing vocational guidance at the moment to find a good field to study. I live in Paris, France. Now I will answer the questions. We’ve been hearing a lot about the rise of antisemitism in Europe in general and France in particular lately. 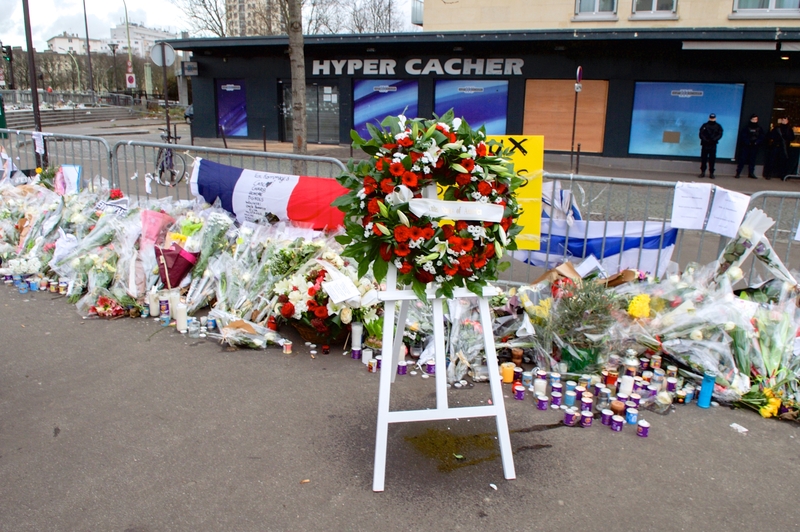 French Jews have been targeted in several horrific terror attacks in recent years, and there’s been a lot of talk on the news about Jews feeling more and more afraid and leaving Europe in large numbers. What is your experience of this as a religious Jew currently living in Paris? Years ago, I didn’t feel a lot of antisemitism, but this is changing. You know, there is a lot of antisemitism on the Internet, because of a lot of things. There’s an antisemitic comedian called “Dieudonné”; there are tensions between Jews and Muslims because of their positions on the Israeli-Palestinian conflict; and there are antisemitic things we can easily find on the internet. Because of these, antisemitism is gaining more success in this country. In 2012 we had an attack on a school in Toulouse, and in January 2015 we had the attack on the Hypercacher supermarket in Paris, and I live nearby so I could see everything. Both attacks were carried out by terrorists and I think in every religious extremism there is antisemitism, so Jews are a a good target for the terrorism. I’ve been the target of antisemitic remarks from diverse people, from some people who believe in conspiracy theories etc., and from some Muslims, since there is a lot of tension between Jews and Muslims in France because of our positions on the Israeli-Palestinian conflict. Here is a video showing what happened in 2014 between extremist Jews and Muslims in Paris during the war in Gaza. But I hope we will have peace one day. I know that you plan to make aliyah in the relatively near future. Why do you want to emigrate to Israel? I would like to make aliyah one day because it’s an ideal to be in the Holy Land and I have a particular feeling in Israel that I cannot describe. I call it “the feeling of being in Israel”, maybe a connection between me and this land. I also feel at home in Israel. I feel at home in France, too, but in Israel it’s more so. 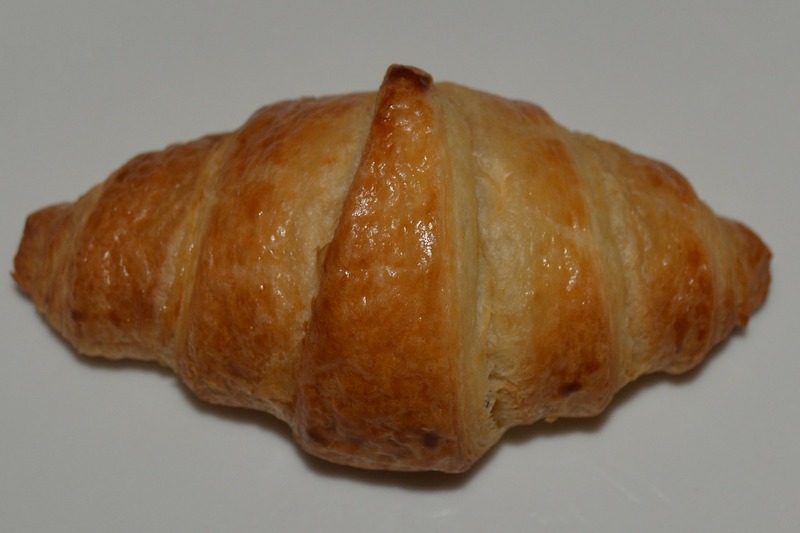 What are your three favorite things about being Jewish in France? I know that you are involved in an online community for dialogue and peace activism between Jews and Muslims and Palestinians and Israelis. What inspired you to join these efforts? Has this dialogue changed you or your views in any way? If so, how? I think the peace between Jews and Muslims and between Israelis and Palestinians is very important for the future of the Jewish people, so that’s why I feel involved. Jews and Muslims have a lot in common but because of our positions in the conflict, our relations are difficult. And that’s why I feel involved in the conflict. One of my Israeli teachers of Hebrew showed the students documentaries that were very difficult emotionally to watch. Then a Facebook friend added me to some Facebook groups of dialogue between Israelis and Palestinians, I started to have hope for the peace when I saw this. Then I added some Palestinians as my Facebook friends. It changed some stereotypes I had about Palestinians, like “they are all terrorists, etc.” and I understood that they live in a very difficult situation. One of my Palestinian friends is a peace activist. When I come to Israel, I hope to meet some of my Palestinian Facebook friends and discuss these issues with them. The majority of French Jews are of North African/Sephardic descent, many of whom emigrated to France after the French withdrew from their colonies in North Africa. Can you tell us a little about your own family’s background? My father is from Morocco, and my mother is from Tunisia. The majority of French Jews are from North Africa because they lived in French colonies and were educated in the French culture. That’s why my parents speak French as well as Tunisian & Moroccan Arabic. My parents emigrated to France because there was a rise in antisemitism in Arab countries after the wars in Israel. They chose France because they were familiar with the culture of the country, making it easier to integrate in France than in Israel. My mother told me she went to France on a ship with her brother and her mother, and after years of working they integrated successfully. My father didn’t tell me a lot about his story because he never wanted to talk about it. You can find out more about the Jewish exodus from Arab and Muslim countries on Wikipedia. I know you were not raised observant, but currently identify as such. Can you tell us a little about this process? What made you decide to become religious? What obstacles have you encountered? I had spiritual questions in high school so I decide to learn about every religion and talk to my rabbi, then I started to read books about the Judaism and I liked this religion, so I became more and more religious over time. My family was opposed at first because they were afraid I would become extremist, but things are good today with my family and we have almost no tension over religion. I wish the best to you and to everybody. Are you a member of a religious minority in your country? Write us a guest letter, or a request to be interviewed! We want to hear your story! I don’t know if you know this about me, but I am fascinated with languages. Recently I’ve been on a very strict regimen of learning Spanish on DuoLingo. I’ve been practicing almost every day since the beginning of the summer, and creo que puedo decir que mi castellano es mucho mejor ahora. O, se puede decir, es existente. 😛 They say that people with musical abilities tend to be better at grasping languages, and in these past few months I’ve developed a theory why. When I immerse myself in a new language, I start hearing words, phrases and sounds from it echoing in my thoughts, much the way I get a catchy song stuck in my head. Anyway, what I’ve found in the last few days is that the language reverberating in my head has not, for a change, been Spanish. I studied French as a third language in eighth and ninth grade. Personally, in retrospect, I think they should have been teaching us Arabic. But given that those years were the height of the second Intifada, and that it was a religious school that was not supposed to have a political affiliation but quietly arranged buses to anti-disengagement protests… you can imagine that maybe some among the staff and the parents might not have been so thrilled with that choice. So French it was. And it so happened that in eighth grade, I had a unique opportunity to travel to Paris with my school choir. We visited several Jewish schools and communities in Paris, and when we weren’t performing, we toured. It was my first time in Europe, and my maternal grandparents had firmly instilled within me an appreciation for high culture, art, music and travel, so I was well trained to appreciate Paris. 😉 The trip was wonderful and left me hoping to return someday. However. There was one thing that struck me about being in Paris that I had never felt before in the USA or in Israel. Something that I felt again, several years later, in the city you call home. Something that I felt as a Jew, especially when visiting the Jewish communities in those cities. If you give it some thought, it kind of sounds ridiculous. I mean… I live in Israel, right? This trip was in March of 2001. 8 Israelis were killed and about 45 were injured in terror attacks in that month alone. My trip to Barcelona was in 2006, just three months after the Second Lebanon War, in which I personally dodged a few Katyushas in Haifa. Certainly, far more Jews have been killed on racist/nationalist grounds in Israel than in France or Spain over the past fifteen years. But in Israel we do not tuck our Stars of David under our shirts. In Israel we do not hide our synagogues behind heavy metal gates and stern security personnel. And obviously, in Israel, we do not avoid speaking or wearing Hebrew in public. Seeing Jews do these things, just as a matter of daily life, was appalling to me. It felt backwards, so different from the feeling of being Jewish in America (or even in London, which I visited in 2004), and from the kind of fear we deal with in Israel. The news from Paris last week was horrifying but not surprising to me. (And frankly I find it upsetting that the world’s attention was focused solely on Paris while 2,000 people were massacred by Boko Haram in Africa. But I digress.) There has been a serious uptick in antisemitic incidents in Europe in general and France in particular lately; boosted by the war in Gaza, but it was on an upward trend beforehand, too. I don’t need to read the papers to know this; all I have to do is open my ears. I’ve been hearing more and more French on the streets. This year was the first time in Israel’s history that France topped the countries of origin for olim, new immigrants to Israel. 7,000 French Jews moved here in 2014–and that includes the exhausting war we had this summer. If you ask any of these olim, they will tell you that they’ll take the rockets over the constant, looming threat of antisemitism any day. At least, they say, here, we are in charge of our own destiny. France is the world’s third largest Jewish community, after the USA and Israel. But a few years down the line, that may no longer be true. The Jews are fleeing France. And when Jews start emigrating en masse, it is not a good sign for the place from which they’re fleeing. Persecution often starts with Jews, but it never ends with them… and we already saw that in Paris last week.